I moved a lot as a kid, more times than I can count actually. It was rare that I didn't end up at a new school each year actually and with each new school came a new crowd and new "cliques" to learn, maneuver around, and mostly just avoid in my case as it was never worth the effort. Claire, on the other hand, when she finds herself in the smack middle of the "Pretty Girl Committee" clique at her new school purely by the fact that her family is renting a guest house on the estate of the head "Pretty Girl" Massie. The Clique reminds me a bit of a tamed down family friendly version of Mean Girls with a girl power twist. It's actually fun, and the "Pretty Girls" turn out to be just as vulnerable and unsure of themselves as everyone else. As much as I pretend I do not like super girlie movies I saw a lot of myself in Claire. I always dressed how I wanted which caught me a ton of slack in school, though ironically my "style" from back then seems to be all the fad these days. Though I usually got attention from the popular crowd the first few days in a new school without fail I would end up doing something to piss them off, usually on purpose, and end up on there bad side. Claire is a girl who knows what she wants and doesn't want to be something she isn't just to fit into the little "Pretty Girl" Clique, good for her. Strangely enough even though it's about "mean girl" type cliques its really a positive story for girls as it's always on the back of every adolescent girl's mind that they really want to be popular. Even I did regardless if I wanted to admit it or not. 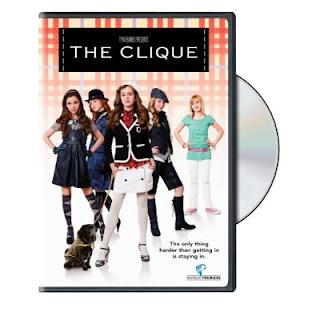 The Clique is available right now on Amazon!